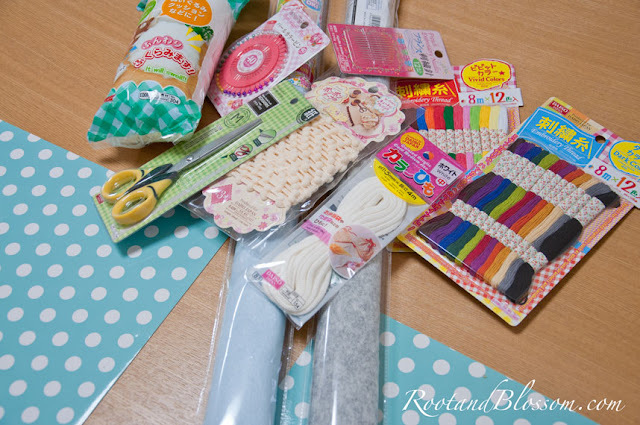 So, I did manage to get my sewing machine to Japan in one piece however the boxes I shipped to Japan two weeks before we left still haven't arrived leaving me sans essential sewing tools. If you've been following me for at least a year now you know how smitten I am with the Japanese dollar stores, ie the 100yen store. I was sort of antsy the first week because I didn't have any projects to work on so I figured that I'd make a small purchase at the local store. Yes, this was all purchased at the dollar store. I know the mats aren't needed for the project but I thought they were so cute and wanted to share! 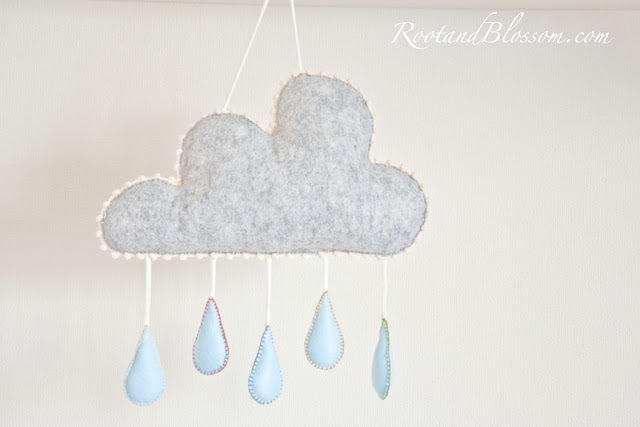 The bummer is that I don't have a scanner, otherwise I'd scan the cloud and raindrop template I created. 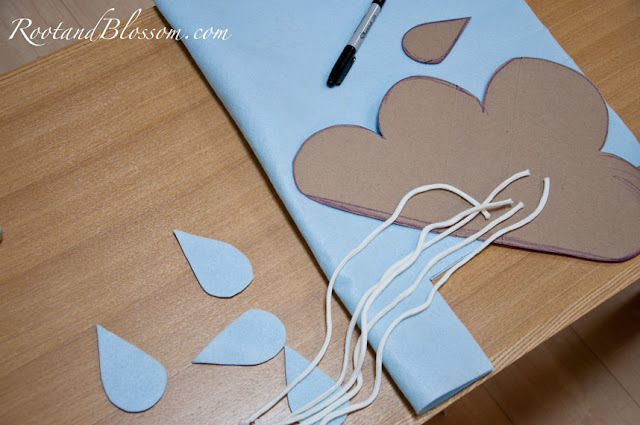 Don't be intimidated though, I sketched a cloud shape on a piece of cardboard with a crayon, you can do it! For reference my cloud was a little wider than a foot long and 9+ inches tall. 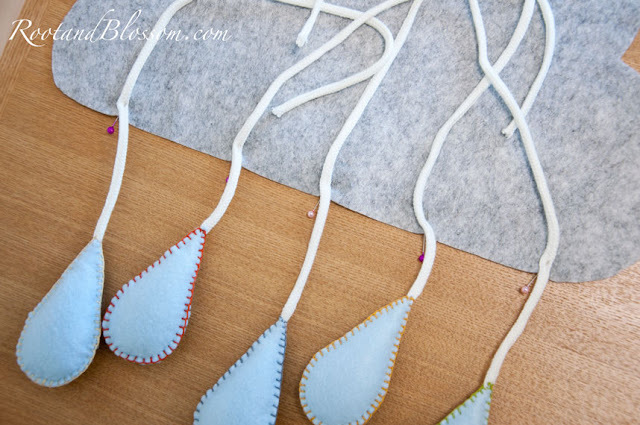 The five tear drops were also about 2 inches wide and 4 inches tall. 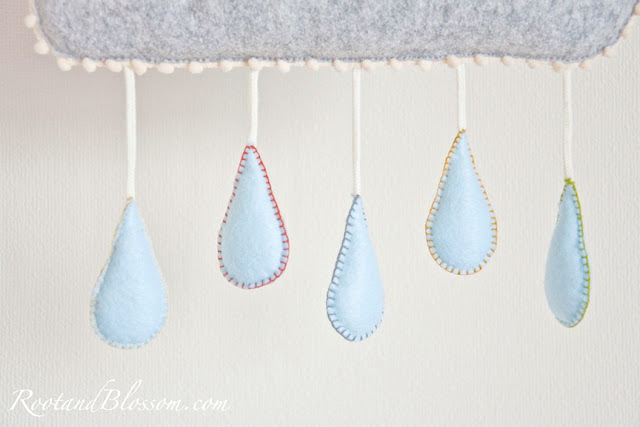 I picked five different coordinating colors of embroidery thread to blanket stitch around the raindrops making sure to begin by attaching the drawstring rope to the top of the drop (I added a knot to the end of the drawstring before sandwiching it between the felt. 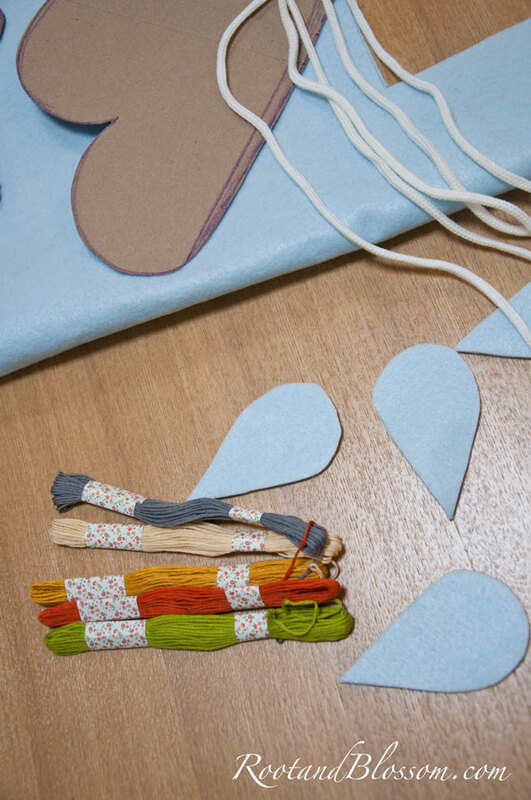 Blanket stitch almost all the way around, add the batting then finish stitching them up. 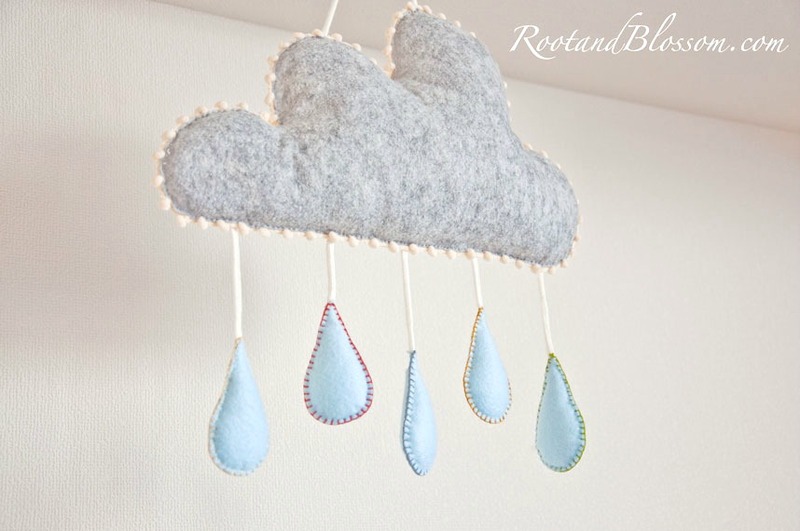 Pin the raindrops evenly on the bottom of the raincloud at desired lengths. 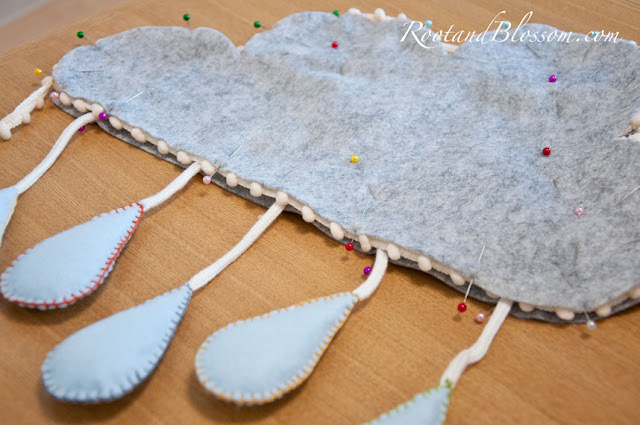 Next, pin the pom-pom yarn around the outer inside edge of one of the cloud cutouts. 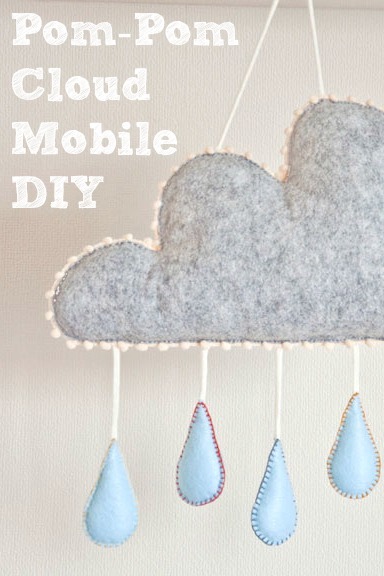 Before you begin stitching around the cloud, pin a piece of the drawstring rope to the top of the cloud (seen below) like you pined the raindrops so you are able to hang the mobile. 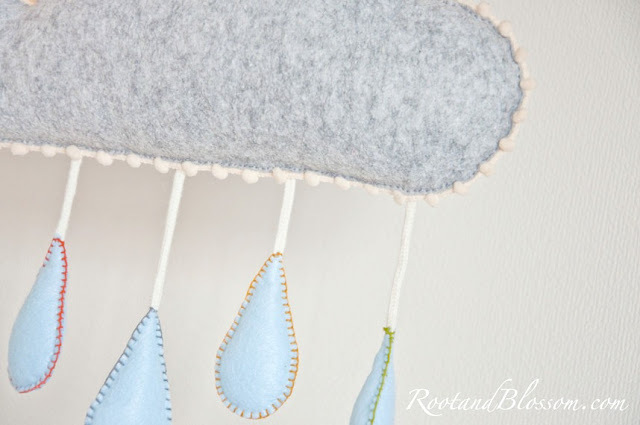 Hand straight stitch with your choice of embroidery thread color all the way around the cloud being mindful of attaching the pom-poms evenly between the two pieces of cloud felt. Leave a small opening to stuff with batting and then seal. This was such a fun and quick project! I love the touch of home it adds to Gabriel bedroom now and what I really love is that it was a dollar store project that looks super not dollar store. Oh my goodness I am in LOVE with this! What a cute idea! I wish our dollar stores had this much fun stuff. 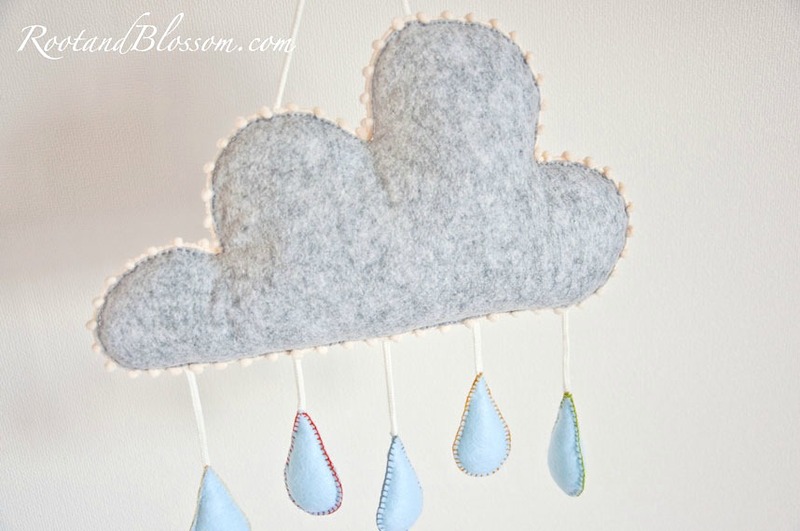 I'm glad your sewing machine came so you could make this and share it with us! This sounds so simple! Even a non-sewer like myself might be able to do it ;) Thanks for sharing! Oh my! This is precious! It's so unique! Totally! You are absolutely right! Do it! And when you do, blog it so I can see! :) I imagine you'll put your own awesome and wonderful spin on it. Thanks Jennifer- so fun to make. Cute cloud! I love the raindrops! It's funny how I love them in things like this but being from Seattle most of the time they bum me out haha. Thanks for the invite Rachel!